731 pages | 191 B/W Illus. 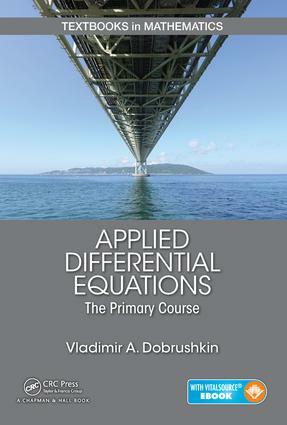 Applied Differential Equations: An Introduction presents a contemporary treatment of ordinary differential equations (ODEs) and an introduction to partial differential equations (PDEs), including their applications in engineering and the sciences. Designed for a two-semester undergraduate course, the text offers a true alternative to books published for past generations of students. It enables students majoring in a range of fields to obtain a solid foundation in differential equations. The text covers traditional material, along with novel approaches to mathematical modeling that harness the capabilities of numerical algorithms and popular computer software packages. It contains practical techniques for solving the equations as well as corresponding codes for numerical solvers. Many examples and exercises help students master effective solution techniques, including reliable numerical approximations. This book describes differential equations in the context of applications and presents the main techniques needed for modeling and systems analysis. It teaches students how to formulate a mathematical model, solve differential equations analytically and numerically, analyze them qualitatively, and interpret the results. "The author covers traditional material along with modern approaches for analyzing, solving, and visualizing ODEs. The topics are accompanied by mathematical software codes for some of the most popular packages … . The text contains a large number of examples from different areas … . It also includes advanced material for students who want to obtain a deeper knowledge on this subject. … the textbook contains a great number of exercises. In addition, each chapter ends with summary and review questions, making the text well-suited for self-study as well." "Two notable aspects of the book are its comprehensiveness and tight integration with applications. … There is much to like about this book — lucid writing, clear development of the basic ideas, and a very large number of exercises with a good range of difficulty. … a very attractive text." Vladimir A. Dobrushkin is an associate of Brown University.